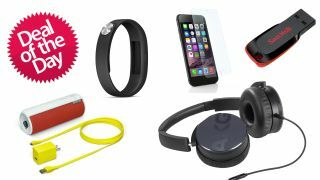 TechRadar Deals: USB sticks, headphones, speakers, tablets + more! Whether you're after Christmas presents for the family or simply looking for bargains for your own good self, we've got some deals for you! How about picking up a Google Chromecast? Stream iPlayer, Amazon, Netflix, BT Sport and more straight to your TV without any smart features required! And it's still just £20 at Currys. Or if you're still into old school forms of home entertainment, Zavvi is currently doing two Blu-ray movies for £12. AKG make superb headphones at Amazon currently has a great deal on the AKG Y50 foldable on-ear model. They're ideal for taking with your on trips as they'll fold nicely into a bag, and the most important thing is that they're currently just £49.95 at Amazon. This would make a superb Christmas present for someone. The Ultimate Ears BOOM portable speakers look awesome, sound excellent and the battery lasts for up to 15 hours of constant use. Pick one up at Currys for £99. Everyone needs a USB stick every now and then. But did you know you can pick up a 64GB stick for under £20? Amazon currently has the SanDisk Cruzer Blade 64GB for just £19.98. If you're just bought an iPhone 6 you really need to look after it! First thing you should do is grab a screen protector, and the Anker Premium screen protector is currently available at Amazon for just £7.99. And how about finally clambering aboard the wearable tech revolution? The Sony SWR10 SmartBand activity tracker is currently just £39 at Amazon. When a call or message comes in, the SmartBand gently vibrates on your wrist to let you know.